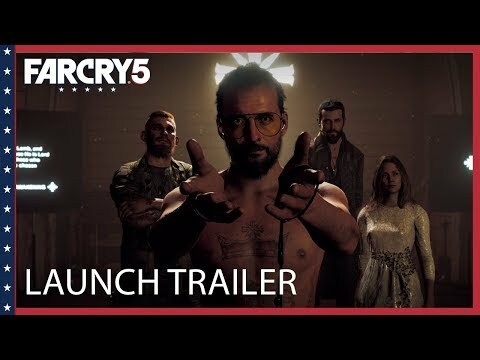 Far Cry 5 was released on PC, PS4 and Xbox One 389d ago in the US and the UK. Notify me when Far Cry 5 is available. Based on 40 Far Cry 5 reviews, Far Cry 5 gets an average review score of 83. Far Cry 5 is a cover-to-cover classic, fans of Far Cry, or open world sandbox games in general, cannot ignore. Far Cry 5 is hands down the best yet for the series, and may be the best Ubisoft title ever. Far Cry 5 provokes its audience to think and wrestle with the uncomfortable answers to our own “what-ifs” about faith, family, and the power of community. Far Cry 5 doesn’t strike me as a reformation of a series formula that has worked well for years, but rather a baptismal into something new. Far Cry 5 is the best Far Cry to date. If you’re itching for a hootin’ and hollerin’ good time with the good ol’ boys and gals of ‘Murica, look no farther than Far Cry 5. And so what we get in the end is a Far Cry that is both structured and full of open player-agency and emergent activity. Far Cry 5 is another improvement to a series that hit its stride quite a long time ago. Ubisoft have cherry-picked everything that has made the Far Cry series successful, and distilled it into a single, laser-focused package. Taking on Eden's Gate is compelling, horrific, and an awful lot of fun. The best Far Cry yet, with well written characters, lots of freedom to play how you want, and a lot of fun to be had on your own or with a friend. If you can survive the tonal whiplash, you'll find a great game here and Far Cry Arcade only makes it better. Far Cry 5 is the thoughtful next step in a series renowned for shooting first and thinking second. Far Cry 5 isn’t revolutionizing open world gaming, but it is a perfection of one of Ubisoft’s most noteworthy series. We didn’t get it with the last two numbered entries in the series, but Far Cry 5 feels like the generation leap that fans have been waiting for. It is easily the best of the series, and represents a positive step in a new direction. Simply put, the fifth numbered chapter in Ubisoft’s series of madness, freedom and exploration is Far Cry perfected. CONCLUSION Far Cry 5 is an absolute blast from beginning to end, chock full of things to do and involve yourself in. I kept returning for more of the narrative in Far Cry 5. From its tense opening to its blistering conclusion, Far Cry 5 is another cracking instalment in the series. Far Cry 5 is mechanically sound and varied. The best Far Cry yet and one of the best open world shooters of any kind, with an impressive variety of missions and non-linear structure. This is a phenomenal open-world shooter and an excellent Far Cry. Far Cry 5 is exactly that – more Far Cry. Far Cry 5 doesn’t deviate too much from the Far Cry formula, simply expanding upon what the series is known for. A polished and refined instalment that values your time more than the previous games and keeps the focus on entertaining you throughout. Its failures prevent Far Cry 5 from being a classic, but its successes mean it has plenty to keep you embroiled in its reactive world. It’s never bad, but considering how great the past games have been, its overall predictability is disappointing. Far Cry 5 is a solid first-person shooter set in a vibrant, breathtaking location. he best thing we can say about Far Cry 5 is that it's competent, and the worst that it's far too safe. If you liked the other Far Cry games, you'll like this one, because it's more of the same. It’s a shame that the plot turns what could have been an interesting, critical title into one that’s simply yet another serviceable AAA game for mass consumption. More future primitive than highly evolved, there is some fun to be had here, but ultimately it’s a game that adds nothing of substance to either genre or franchise. It’s at once disorienting and noncommittal. It fails to do anything better than other games before it. In context, though, Far Cry operating as if it’s business as usual is the series at its most oblivious.